Every minute, one garbage truck worth of plastic enters the world’s oceans. The Great Pacific Garbage Patch, located between Hawaii and California, is the largest accumulation of ocean plastic worldwide. It covers an area which is three times the size of France, illustrating the devastating extent of marine pollution. If this plastic pollution is not reduced, U.N. Secretary-General António Guterres warned that by 2050 there could be more plastic in the oceans than fish, measured by weight. Studies show that marine pollution, together with over-exploitation and climate change, threatens to cause mass extinctions of marine species, unless action is taken. According to U.N. Environment, marine plastic debris is conservatively estimated to have a financial damage of 13 billion USD yearly as it endangers marine species, fisheries, tourism and businesses. 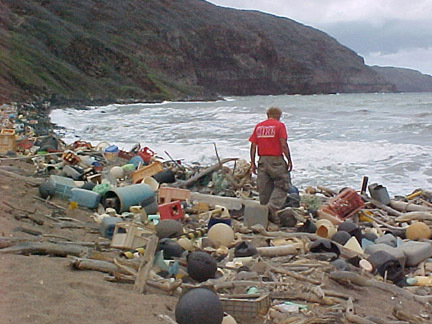 Marine litter also directly affects us humans as pollutants are carried into our food chain. Concerns over the oceans’ plastic pollution have increased at an unprecedented level and unite actors worldwide in their fight against plastic waste, forcing decision-makers into action. Demands have grown for finding solutions to protect the marine environment, with the Director-General of the U.N.’s Food and Agriculture Organization emphasising that the oceans can no longer be treated as a ‘waste swimming pool’. Nevertheless, the plastic pollution of the oceans is certainly not new. What may be new is that the European Commission has sharpened its tone. While not without its critics, EU Budget Commissioner Günther Oettinger proposed the introduction of a plastic tax at the beginning of this year in order to increase the cost of plastic. On Monday, the Commission presented a draft directive, aiming to introduce EU-wide rules to ban several disposable plastic items. This move is believed to promote growth and create new jobs due to the need to develop environmentally-friendly alternatives to plastic. These efforts are the latest in a number of similar policies implemented in countries around the globe with the proclaimed aim to reduce the oceans’ pollution, including also the ban of plastic bags in countries like Rwanda. In line of the European Strategy for Plastics in a Circular Economy, the Commission’s draft directive also envisions an increased recycling quota for other products and new labelling requirements in order to sensitise consumers and encourage environmentally sound disposals. If successful, it will take time until these plans are implemented, with the proposed directive now first having to go to the European Parliament and Council for approval. Despite being celebrated as a chance to provide us with a pan-European solution for the plastic problem, critics assert that these plans are developed not for the environment, but for the conscience. Are they perhaps only ‘a drop in the ocean’? Merely 9% of the plastic worldwide is recycled. While the recycling rates in highly-industrialised countries are far from being ideal, the majority of the plastic that is dumped into the oceans originates from fast-developing countries in Asia where waste management systems are underdeveloped or non-existent. The shift towards improved waste management systems overall will require increased international collaboration and a change in consumers’ behaviour worldwide. Effective government regulations need to support this move away from our ‘throw away’ plastic consumer culture. As a way to tackle the very roots of the problem, the introduction of carbon taxes has been repeatedly proposed in order to reduce the petroleum-based plastic production. As climate change is also a harmful externality of the fossil fuel industry, both climate change and the oceans’ plastic pollution are consequences of cheaply-priced oil. A carbon tax could internalise the true costs of oil. The inexpensive prices of both plastic and oil do not reflect the ecological damages they cause. Carbon taxes may also encourage recycling efforts as they tend to be less energy-intensive than the production of plastic. What becomes clear is that a holistic approach is necessary to tackle the global environmental issue of the oceans’ plastic pollution. The solution to this problem requires the cooperation of all actors on all levels. The effectiveness of the strategies in Europe and beyond can certainly be challenged, but one achievement is certainly that the use of plastic is further discussed and awareness is raised. There is a lot we can do; the question is only if we are fast enough. Today’s public and political concerns need to be intensified in the years to come in order to continue to put pressure on decision-makers so that the global problem of plastic marine debris is effectively and sustainably addressed. The future of the oceans is in our hands.